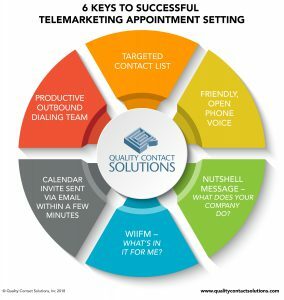 All outbound telemarketing appointment setting professionals know that the third key component of success is the list that you are calling. In this 3rd part of this series on telemarketing appointment setting, I’ll share my experience with curating the best outbound call list. Because our company primarily focuses on B2B appointment setting, I’ll focus there. How do you identify what list to purchase? If you already have existing customers for your product or service, it may be best to start by identifying what characteristics make up your best customers. By identifying your best customers and what characteristics are similar across those customers, that becomes your criteria for purchasing prospect data to make outbound telemarketing appointment setting calls to. Because NAICS is more specific than an SIC code, we prefer to purchase outbound telemarketing call lists using NAICS. This allows us to narrow the list to ensure we aren’t purchasing data that isn’t applicable for a particular client. For example, for a travel solutions client, the client is looking for businesses that have employees that travel. One of our good segments is construction. The NAICS code for construction starts with 23. So we know that purchasing all available data that has a NAICS code that starts with 23 is a waste of money. By narrowing down to the type of construction, we can get better results. Single family home construction companies (NAICS 236115) don’t tend to have employees that travel. Specialized large project construction companies (like NAICS 236210) tend to have employees that travel. They go to where the work is because large projects are not concentrated enough in the geographic region where the construction company is located. This is just one example. Once you’ve identified your best customers, purchased a list of more prospects that have the same characteristics as your best customers (called a look-a-like model), then you start placing calls. As you get call result data (disposition data) from the outbound B2B telemarketing appointment setting campaign, you can feed the result data back to your data scientists to validate the model and to tweak the model based on real performance. At QCS, we have a List Analyst on staff to help our clients through the list purchase process. List acquisition is a highly specialized field and the options are varied. As a rule of thumb, we like to purchase data from compiled resources like D&B, InfoUSA, and Accudata. Knowing who you want to target your calling effort to, knowing the results of the calls, and tracking performance by list segment will help drive smarter list acquisition efforts.